Our review: Light lemon yellow in color, this wine has aromas of green apple with notes of citrus blossoms and spice. Initially pleasantly tart on the palate, the flavor profile is similar: green apple and lime zest. Some minerality also develops. The finish is long, but flat and uninteresting. Our rating: This isn't a complex wine, but at the equivalent of $4 a bottle, it probably doesn't necessarily need to be one. Best suited for picnics or backyard barbecues, or even quiet evenings at home with a pizza watching television. Although it isn't bad, scoring on the low side of Average, we're not sure we'd buy it again; the Barefoot Pinot Grigio NV, for example, costs about the same (on sale), yet is a much better wine. Taste profile from the winemaker: "A bright, well-balanced wine with juicy fruit flavors. It has lovely floral aromas with notes of citrus blossoms and flavors of lemon-lime and hints of peaches. The wines goes well with barbecued chicken and grilled sea bass served with fresh fruit like pineapple and melons as well as aged, mellow cheese." 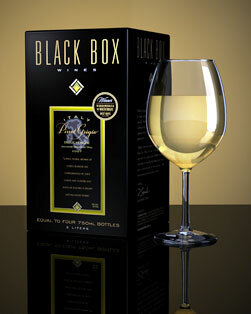 Winery website: Black Box Wines.